Adding to the rapidly expanding Aeroic range, we are now proud to announce the Gremlin 60” (1.5M) Aerobatic/3D, another new, high performance aerobatic “BIBOC” sailplane from successful designer Dr. James Hammond. We wanted to make a small, high performance addition to the Aeroic range, but with ease of transport and affordability in mind, plus extreme flexibility of build type and so the BIBOC concept was born. “BIBOC is a new acronym that we have coined and means “Bung In Back Of Car” – in other words, it means a small and really easy to beak down model that is meant to be carried around with you – just for those chance opportunities, and times when you just have to fly something. Like its agile siblings, the “Big Air” Aresti 108, and the smaller 2M version, Gremlin has exceeded expectations throughout the entire design and flight envelope. Its light so it will fly in almost anything, and with its large ballast capacity and responsive reflex section, Gremlin is happier with wind under its wings, but can handle anything but virtual flat calm situations very well. James always uses his own tried and tested design method, first listing a set of strict design goals and calculations based on the work the plane has to do. He then draws up an outline sketch with the correct aerofoil sections that will fulfill those goals. The “practical side being done and the desired performance envelope ensured, he then curves and tweaks the design until it looks right. 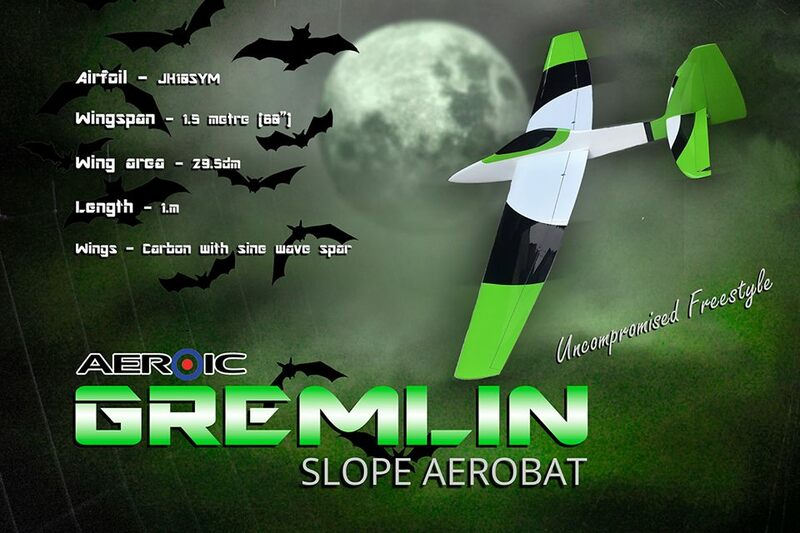 The Gremlin 60, like any well designed slope plane is easy to fly. 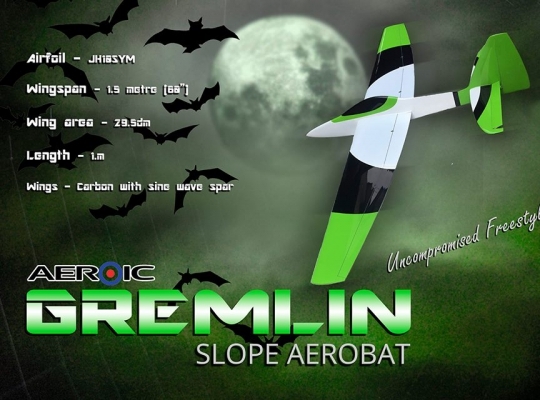 It has an optimized wing plan form; good ballast capability, and features flight-proven wind tunnel tested aerofoils. Designed with an 18mm round carbon tube joiner which can be filled with ballast, act as a normal joiner, or as a shaft for wing rotation, the Gremlin can be built as Wingeron, or even as a Pitcheron configuration. This is helped by the tailplane design, which can be configured as either AMT or Elevator, and can be constructed by a competent builder to give the huge movements that 3D flyers require. There is a great truism: “If it looks right, it will fly right…” like the rest of the Aeroic range, this is backed up 100% with the Gremlin 60”. Originally designed as F3X type tailplane aerofoils, the sections used on the Gremlin are now well proven. Used on both the Aresti 80 and the Aresti 108, the profiles were refined to provide maximum control response with minimum deflection, and therefore drag; so the trade off was the infinitesimal increase in drag but completely offset by the increased control response for less deflection. At 10%, the fully symmetrical double cusped section is thick enough to give good aerobatic response yet still carry a large ballast load and will still work well in sketchy air. The optimized sections will let you go from gut busting tumbling aerobatics, through big air, graceful maneuvers down to really slow landing speeds with the large flaps down. 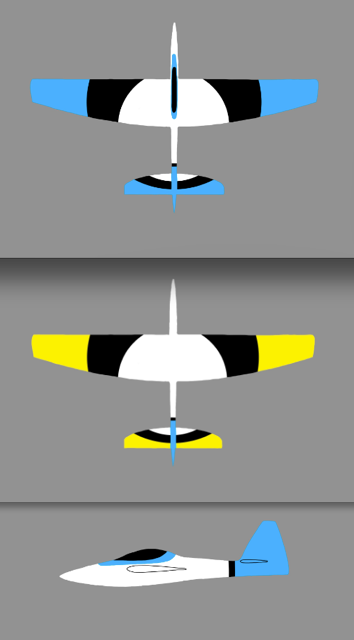 Large ailerons, large flaps and a semi elliptical wing plan form each add to the overall performance of the sailplane. Needless to say the wings are carbon reinforced as standard. Horns are factory fitted with well thought out geometry to allow flush servo installation using almost any servos, making a huge range of servos possible. Using conventional linkages you can get a clean, practical and most importantly serviceable wing installation optimized to use full servo travel to give high torque and low slop. Ballast options in the wing joiner, or fitting your own steel wing joiner add to the flexibility. Used in military aircraft, the Sine Wave Spar has been adapted for the first time to make up the heart of a model sailplane wing, and has frankly amazed us with its low weight, and ultra high strength. Unlike a conventional spar the Sine Wave Spar adds terrific torsional strength and yet actually weighs considerably less than the older non-optimized spar. 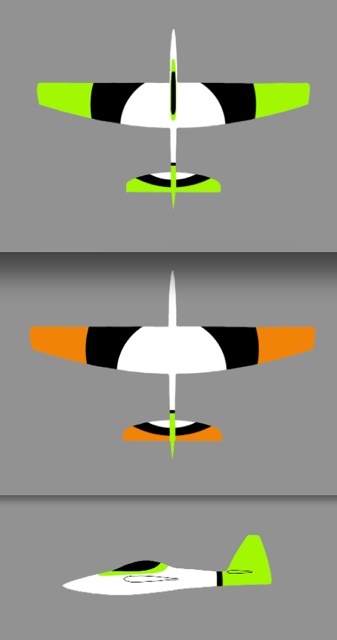 Now to be used in all Aeroteam sailplanes, the Sine Wave Spar is a lighter and far stronger upgrade that raises the technology level yet another notch and could be a game changer in model sailplane technology. The beautifully contoured fuse is deep, and balanced front to back to give the side area required for some aerobatic maneuvers. It’s strong, light, and stiff, and reinforced in the right places with Carbon/Kevlar. Electronics area is 2.4 GHz friendly with access to the radio and ballast through a conventional slide-on hatch type canopy, while a handy hatch under the fin allows access to a direct elevator servo if needed. The long nose area provides plenty of space to easily balance the model without resorting to shoehorning lead in every nook and cranny. Snakes or rear mounted direct servos can be used for Rudder/Elevator control. These are all positioned to take the ‘head scratching’ out of installing the radio gear. 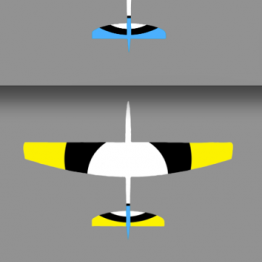 The rudder is designed large enough to be effective for both aerobatics and slow landing speeds. Wing stub fairings with location dowel holes finish the fuselage with green Multiplex connectors to connect the electronics pre routed. Like all of the Aeroteam airframes, the Gremlin has a large joiner, but for the first time its an 18mm diameter (16mm Inside diameter) precision made round carbon tube. This will allow ballast to be placed inside the tube, conversion to wing twist, or simple replacement with a bar of steel or other heavy material should conditions require more ballast. The Gremlin has been designed with far greater capability, flexibility and pure potential than any aerobatic slope model that we know of, but it’s also made for simplicity. 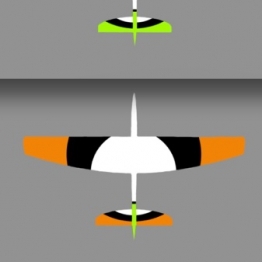 This approach makes the installation straightforward and practical, leads to a sailplane that is a snip to fit out, and a bird that flies like the true thoroughbred it is.